What is your Board & Train guarantee? That’s a tough question when we are dealing with an animal that makes its own choices. Because humans and canines are free thinking, it would be like asking if school teachers have a guarantee on 4th grade students. What the school teachers can guarantee is that they have a curriculum that is taught, respect will be addressed and an application of manners throughout the day will be attended to. Ultimately a lot of the responsibility is up to you, the parent/owner. Our trainers will do the same with the board & train programs. We have a curriculum as well that consists of our word list, manners training throughout the day, and teaching your dog to respect the words as well as people. This will be transferred to you during private lessons. After they go home it is up to you to follow our direction and do your homework. We guarantee your dog will have knowledge of the words and that we will be here to help transfer what your dog has learned. The rest is up to you to change the way you live with your dog. If you choose one of the five week board & train programs, we guarantee to be available to help you for the rest of your dog’s life. 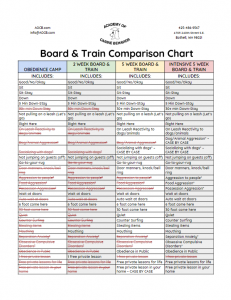 How are your “Board and Train” programs different from each other? We offer four programs where the dogs live with us: 2 weeks Board & Train, 5 weeks Board & Train, Intensive 5 weeks Board & Train, and Obedience Camp. All of these programs have their purpose, to see which your dog is better suited for its recommended you come in for a Behavior Evaluation. Here is a brief run-down. 2 week program that is designed for dogs that do not need any major behavioral modifications, but simply need education for their dogs and the owners on basic obedience commands. We do not accept dogs that have aggression issues, separation anxiety or special instructions for success for Obedience Camp. For someone that just wants a foundation. These dogs typically have no major issues and what issues they do have their owners are willing to work on with our support and the obedience foundation. Most often, the family is going out of town and wants the dog to have some training while they are gone. Dogs in this program will typically have only two trainers that will introduce all of the words on the word list along with basic manners and respect. At the end of the 2 weeks, you will receive a private lesson before taking your dog home and another free lesson within a month of taking your dog home. Your dog will not be rock solid but will have a wonderful foundation. We recommend continuing with one of our Beyond Basics classes. You and your dog will be the rock stars of the class! The “full meal deal” of our training programs. We not only teach all of the words on our list but also additional words-the “Supplemental Word List”- are added to the program. We will also address any specific issues you are having with your dog from aggression to housetraining. Your dog will be taken on field trips to local stores, vet clinics, and parks. Friendly dogs will get to play with other training dogs in our play sessions while the dogs with aggression towards other dogs will get time out to play by themselves with a trainer. For dogs who require the expertise of our Senior Behaviorists in order to be the most successful. Just like the 5 week program, your dog stays here for 5 weeks with you visiting at least once a week, after the second week. The Intensive program comes with free private lessons for the life of the dog. How do I sign my dog up for Board & Train? An evaluation is not required but we do recommend you come in for one if your dog is displaying any aggression, separation anxiety, or housetraining problems. For any other issues, you can simply set up an intake where you will sit down with your Trainer and go over all of the paperwork. What do I need to bring to check in for Board & Train? We have four forms required to accompany every Board & Train dog: Dog Check In Form, Vaccine Requirements & Waiver, and Emergency Contact. These forms do not need to be completed ahead of time, but it will make the check in process much quicker for you. Your dog will need proof of vaccinations prior to being able to board. You can have them faxed to us or bring in a copy with you. Not all vets are open during the hours that we allow check ins, to avoid your dog losing their spot, make sure we have the records ahead of time or that you have them with you. We can not allow any dogs into our facility without completed vaccine records on file. If your dog is here for just 2 weeks or doesn’t tolerate changes in food, we suggest you bring your own food to avoid upsetting their tummy. There is no change in price if you bring in your food vs. your dog eating our provided Kirkland foods. We provide toys, beds, and buckets. If your dog is here for the 5 week program and your dog has issues with guarding items, please bring in something of theirs that we can work with!